Sixteen people, including eight policemen, have been injured in an explosion near the office of a political party in the southern Indian city of Bangalore, police have said. Police said the blast could have originated from a motorcycle parked near an office of the Hindu nationalist Bharatiya Janata Party (BJP). 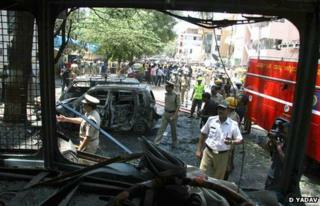 The blast happened in the Malleshwaram area of Bangalore. It took place weeks ahead of key elections in Karnataka state. The BJP runs the government of the state of Karnataka, of which Bangalore is the capital. TV pictures showed a few destroyed vehicles at the site of the explosion. Eyewitnesses said it was a "big explosion which shook some nearby buildings". "Due to the blast, 16 people are injured - eight policemen on duty and eight civilians. Nobody is critically injured. All are being treated at hospital," Karnataka police chief Lalrokhuma Pachau was quoted as saying by Press Trust of India news agency. "As of now, we do not know what material was used in making the bomb," he said. Earlier Bangalore police chief Raghavendra Auradkar told reporters that the explosion took place in a motorcycle parked at the site. "We initially thought it was a gas cylinder explosion. [Now] we believe it is a motorcycle blast - a motorcycle [has been] destroyed," he said. A spokesman of the BJP said he heard a "huge sound" when he was working in the party office. "We found two or three vehicles on fire. Some people were lying on the ground injured," S Prakash told the NDTV news channel. Federal junior Home Minister RPN Singh said investigators were "looking at all possibilities" and asked people not to "give credence to rumours". Karnataka Home Minister R Ashok said it was a "terror attack" but gave no further details. In July 2008, one woman was killed and several others injured when seven bombs hit crowded areas of the city, which is India's information technology hub. Seventeen people died and more than 100 people were injured in twin explosions in the city of Hyderabad in February. The bombs had been planted on bicycles 150m (500ft) apart near a crowded fruit market. It was the first major bomb attack in India since a September 2011 blast outside Delhi's High Court killed 13 people.